Over the past few months the number of articles on global warming have dropped precipitously and have now stopped altogether. Bitterly cold air and howling winds spread across the USA — from the Dakotas to Florida— over the weekend, breaking weather records in the upper Midwest, the Great Lakes and New England. The wintry blast even shocked International Falls, Minn., the self-described “Icebox of the Nation,” where temperatures bottomed out at 37 below zero Saturday and Sunday mornings, breaking records that have stood since 1979. Sioux Falls, S.D., was 30 below on Saturday morning, the coldest temperature recorded since 1974. “We basically have an anomalous high-pressure system that came out of Canada and brought some really cold air with it,” reported Jennifer Laflin, a National Weather Service meteorologist in Sioux Falls. After a slight moderation early this week, yet another cold air mass — likely even colder than this one — is poised to invade the entire eastern two-thirds of the USA by later in the week, said Weather Channel meteorologist Mark Ressler. The unusually powerful high-pressure ridge causing the current freeze is holding at bay warmer air from the west and allowing frigid air to spill directly south from north-central Canada across the Midwest, Laflin said. Snow was the main issue over the weekend in much of New England and the interior Northeast, where nearly 3 feet blanketed Burlington, Vt. The 31.8 inches of snow recorded as of Sunday afternoon represented the city’s all-time biggest snowstorm in 120 years of recordkeeping, according to the weather service’s Scott Whittier in South Burlington. Snow was still falling late Sunday in Burlington. The cold air had marched all the way down the East Coast into south Florida by Sunday, where freeze warnings were issued for nearly the entire state for today. Robert Ritchey, a tomato grower in Alva, Fla., said temperatures dipped to 39 degrees in his 3-acre fields Saturday night. “I ain’t lost any (crops) yet, and I don’t want to,” Ritchey said. Bitterly cold air and howling winds spread across the USA — from the Dakotas to Florida— over the weekend, breaking weather records in the upper Midwest, the Great Lakes and New England. 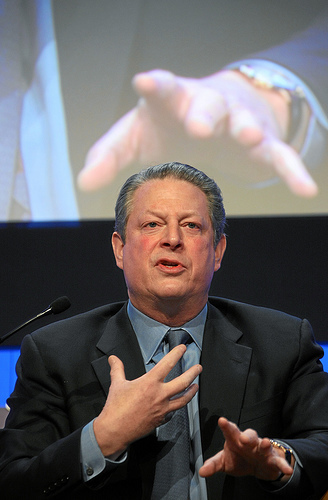 And Gore has been sitting on the sidelines in stunned amazement wondering what to do next. “I’ve spent most of my life warning people that the earth’s temperatures are rising, and that global warming is one of the earth’s greatest problems. I have no clue what the hell went wrong,” admitted Gore. The entire global warming alliance has gone into retreat as the wintry blast even shocked International Falls, Minn., the self-described “Icebox of the Nation,” where temperatures bottomed out at 37 below zero Saturday and Sunday mornings, breaking records that have stood since 1979. Sioux Falls, S.D., was 30 below on Saturday morning, the coldest temperature recorded since 1974. “We basically have an anomalous high-pressure system that came out of Canada and brought some really cold air with it,” reported Jennifer Laflin, a National Weather Service meteorologist in Sioux Falls who showed up to debate Gore. “It really hurts to find out that I’ve been living a lie,” admitted Gore. After a slight moderation early this week, yet another cold air mass — likely even colder than this one — is poised to invade the entire eastern two-thirds of the USA by later in the week. 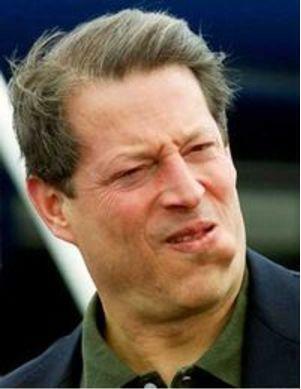 While falling short of taking actual responsibility for the damage being done, the strain on Gore’s face said it all. The unusually powerful high-pressure ridge causing the current freeze is holding at bay warmer air from the west and allowing frigid air to spill directly south from north-central Canada across the Midwest. Gore was able to get the crowd laughing when he showed them the three pair of thermal underwear he was wearing. He had intended to show the crowd a penguin that he had brought along for show and tell, but the penguin had frozen to death in the parking lot. Robert Ritchey, a tomato grower in Alva, Fla., said temperatures dipped to 39 degrees in his 3-acre fields Saturday night. “I ain’t lost any crops yet, and as long as Al Gore keeps his stinking fingers out of the mix, I won’t have to,” Ritchey said.